Not to be confused with open range. In the case of poultry, free range was the dominant system until the discovery of vitamins A and D in the 1920s, which allowed confinement to be practised successfully on a commercial scale. Before that, green feed and sunshine (for the vitamin D) were necessary to provide the necessary vitamin content. Some large commercial breeding flocks were reared on pasture into the 1950s. Nutritional science resulted in the increased use of confinement for other livestock species in much the same way. In the United States, USDA free range regulations currently apply only to poultry and indicate that the animal has been allowed access to the outside. The USDA regulations do not specify the quality or size of the outside range nor the duration of time an animal must have access to the outside. The term "free range" is mainly used as a marketing term rather than a husbandry term, meaning something on the order of, "low stocking density," "pasture-raised," "grass-fed," "old-fashioned," "humanely raised," etc. 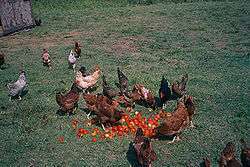 In poultry-keeping, "free range" is widely confused with yarding, which means keeping poultry in fenced yards. Yarding, as well as floorless portable chicken pens ("chicken tractors") may have some of the benefits of free-range livestock but, in reality, the methods have little in common with the free-range method. A behavioral definition of free range is perhaps the most useful: "chickens kept with a fence that restricts their movements very little." This has practical implications. For example, according to Jull, "The most effective measure of preventing cannibalism seems to be to give the birds good grass range." De-beaking was invented to prevent cannibalism for birds not on free range, and the need for de-beaking can be seen as a litmus test for whether the chickens' environment is sufficiently "free-range-like." The U.S. Department of Agriculture Food Safety and Inspection Service (FSIS) requires that chickens raised for their meat have access to the outside in order to receive the free-range certification. There is no requirement for access to pasture, and there may be access to only dirt or gravel . Free-range chicken eggs, however, have no legal definition in the United States. Likewise, free-range egg producers have no common standard on what the term means. The broadness of "free range" in the U.S. has caused some people to look for alternative terms. "Pastured poultry" is a term promoted by farmer/author Joel Salatin for broiler chickens raised on grass pasture for all of their lives except for the initial brooding period. The Pastured Poultry concept is promoted by the American Pastured Poultry Producers' Association (APPPA), an organization of farmers raising their poultry using Salatin's principles. Traditional American usage equates "free range" with "unfenced," and with the implication that there was no herdsman keeping them together or managing them in any way. Legally, a free-range jurisdiction allowed livestock (perhaps only of a few named species) to run free, and the owner was not liable for any damage they caused. In such jurisdictions, people who wished to avoid damage by livestock had to fence them out; in others, the owners had to fence them in. The USDA has no specific definition for "free-range" beef, pork, and other non-poultry products. All USDA definitions of "free-range" refer specifically to poultry. In a December 2002 Federal Register notice and request for comments (67 Fed. Reg. 79552), USDA's Agricultural Marketing Service proposed "minimum requirements for livestock and meat industry production/marketing claims". Many industry claim categories are included in the notice, including breed claims, antibiotic claims, and grain fed claims. 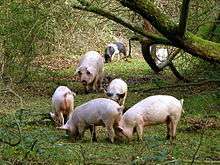 "Free Range, Free Roaming, or Pasture Raised" would be defined as "livestock that have had continuous and unconfined access to pasture throughout their life cycle" with an exception for swine ("continuous access to pasture for at least 80% of their production cycle"). In a May 2006 Federal Register notice (71 Fed. Reg. 27662), the agency presented a summary and its responses to comments received in the 2002 notice, but only for the category "grass (forage) fed" which the agency stated was to be a category separate from "free range." Comments received for other categories, including "free range," are to be published in future Federal Register editions. 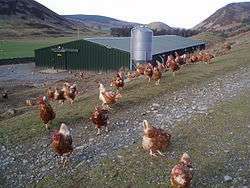 the open-air runs must at least satisfy the conditions specified in Article 4(1)(3)(b)(ii) of Directive 1999/74/EC whereby the maximum stocking density is not greater than 2500 hens per hectare of ground available to the hens or one hen per 4m2 at all times and the runs are not extending beyond a radius of 150 m from the nearest pophole of the building; an extension of up to 350 m from the nearest pophole of the building is permissible provided that a sufficient number of shelters and drinking troughs within the meaning of that provision are evenly distributed throughout the whole open-air run with at least four shelters per hectare. Otherwise, egg farming in EU is classified into 4 categories: Organic (ecological), Free Range, Barn, and Cages.) The mandatory labelling on the egg shells attributes a number (which is the first digit on the label) to each of these categories: 0 for Organic, 1 for Free Range, 2 for Barn and 3 for Cages. There are EU regulations about what free-range means for laying hens and broilers (meat chickens) as indicated above. However, there are no EU regulations for free-range pork, so pigs could be indoors for some of their lives. In order to be classified as free-range, animals must have access to the outdoors for at least part of their lives. Pigs Free-range pregnant sows are kept in groups and are often provided with straw for bedding, rooting and chewing. Around 40% of UK sows are kept free-range outdoors and farrow in huts on their range. Egg laying hens Cage-free egg production includes barn, free-range and organic systems. In the UK, free-range systems are the most popular of the non-cage alternatives, accounting for around 28% of all eggs, compared to 4% in barns and 6% organic. In free-range systems, hens are housed to a similar standard as the barn or aviary. Meat chickens Free-range broilers are reared for meat and are allowed access to an outdoor range for at least 8 hours each day. Free-range broiler systems use slower-growing breeds of chicken to improve welfare, meaning they reach slaughter weight at 16 weeks of age rather than 5–6 weeks of age in standard rearing systems. Turkeys Free-range turkeys have continuous access to an outdoor range during the daytime. The range should be largely covered in vegetation and allow more space. Access to fresh air and daylight means better eye and respiratory health. The turkeys are able to exercise and exhibit natural behaviour resulting in stronger, healthier legs. Free-range systems often use slower-growing breeds of turkey. Australian standards in relation to free-range production are largely espoused in third-party certification trade marks due to the absence of any significant legally binding legislation. A number of certification bodies are utilised by rearers to identify their products with a particular level of animal welfare standards. In events where producers do not choose to use a certified trade mark and merely state that their product is 'free range', the producer is bound by consumer expectations and perceptions of what constitutes free range. Producers are generally thought to be bound to Model Codes of Practice of Animal Welfare published by the CSIRO, and in some states this forms part of legislation. Maximum stocking densities indoors of 30 kg/m2, equivalent to about 14-15 birds/m2. Egg Corp Assured is the weakest standard, set by the industry peak group and largely based on the Model Code of Practice. Egg Corp Assured differs in that it interprets the outdoor stocking density figure as largely irrelevant to welfare. Egg Corp Assured has been known to certify farms running up to 44,000 birds per hectare outdoors, far in excess of recommendations. Like the Model Code of practice, beak trimming is allowed and indoor densities run up to 15 birds per m2. RSPCA Approved Farming is a standard that can be applied to both barn-laid and free-range egg producers. Farms using this certification must have an indoor density of 9 birds/m2 indoors on slats, or 7 birds/m2 indoors in a deep-litter system. The standards dictate a maximum outdoor density of 1500 per ha without rotation, or 2500 birds per ha with rotation, and beak trimming is allowed. Free Range Egg & Poultry Australia (FREPA) standards provides a sliding scale for indoor density, with 10 birds/m2 allowed only in enclosures housing less than 1,000 birds, and 6 birds/m2 the maximum for barns with over 4,000 birds. Nothing is said in the standards about outdoor density, thus it is assumed that farmers must meet the standards under the Model Code. Beak trimming is allowed under this certification. Humane Choice True Free Range standards are some of the most sound as far as animal welfare is concerned. Beak trimming or any other mutilations is not permitted, perches must be provided, and maximum flock numbers cannot be greater than 2,500 per barn. The outdoor stocking density is 1500 birds per ha, and the indoor density is 5 birds per m2. Australian Certified Organic Standards include criteria on feed content and the use of pesticides in addition to animal welfare requirements. The indoor density is a maximum of 8 birds/m2, although most operators under this standard list their density as 5 birds per m2. The outdoor density is 1000 birds per ha, and beak trimming is not permitted. In Australia, free range and organic chicken accounts for about 16.6% of value in the poultry market. This percentage is expected to grow to up to 25% in the next 5 years. No meat birds are raised in cages in Australia. There are three main certification trademarks in this market. Free Range Egg & Poultry Australia (FREPA) standards are those in which most supermarket brands of free range chicken meat are accredited under. These standards require indoor stocking densities of up to 30 kg per m2 indoors (about 15 birds per m2), and beak trimming is not permitted. Outdoor stocking density is not stated, but it is understood that the outdoor range must be at a minimum 1.5 times the floor area of inside the barn. RSPCA Approved Farming standards for free range require an indoor stocking density of about 17 birds per m2, and outdoor densities of up to 17 birds per m2. No beak trimming is allowed under this system. Australian Certified Organic standards dictate a maximum indoor stocking density of up to 12 birds per m2 indoors, and 2500 birds per hectare outdoors. 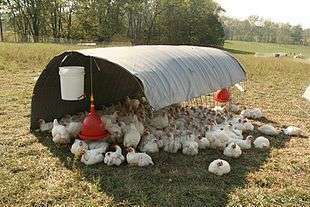 These standards require perches, and prevent large, conventional broiler sheds. Wikimedia Commons has media related to Free range. ↑ "Dictionary definition". Retrieved 3 October 2012. ↑ Heuser, G. F: "Feeding Poultry", page 11. Norton Creek Press, 2003. ↑ Egg Carton Labels: A brief guide to labels and animal welfare The Humane Society of the United States. Updated March 2009. ↑ Jull, Morley A. (1938). 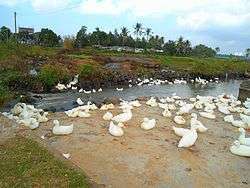 Poultry Husbandry. McGraw Hill. pp. 346–347. ↑ "Meat and Poultry Labeling Terms". Fact Sheets. USDA. Retrieved 22 January 2014. ↑ "Getting Started". American Pastured Poultry Producers' Association. Retrieved 8 January 2013. ↑ "Meat and Poultry Labeling Terms". Fact Sheets. USDA. Retrieved 8 January 2013. ↑ "United States Standards for Livestock and Meat Marketing Claims". Federal Register. USDA. 30 December 2002. Retrieved 8 January 2013.